Having roommates can be fun. When you get to be assigned with a roomie in the dormitory of your school or when you rent a room in a boarding house, you would have automatic and default friends that you can somehow lean and depend on while living away with your family. With roommates that come from different places, religion, culture, and for some, races, you will have a new body of knowledge that could help you get by in life. When you need help and you are away from your family, you will have your roommates as your second family and a 24/7 support system. 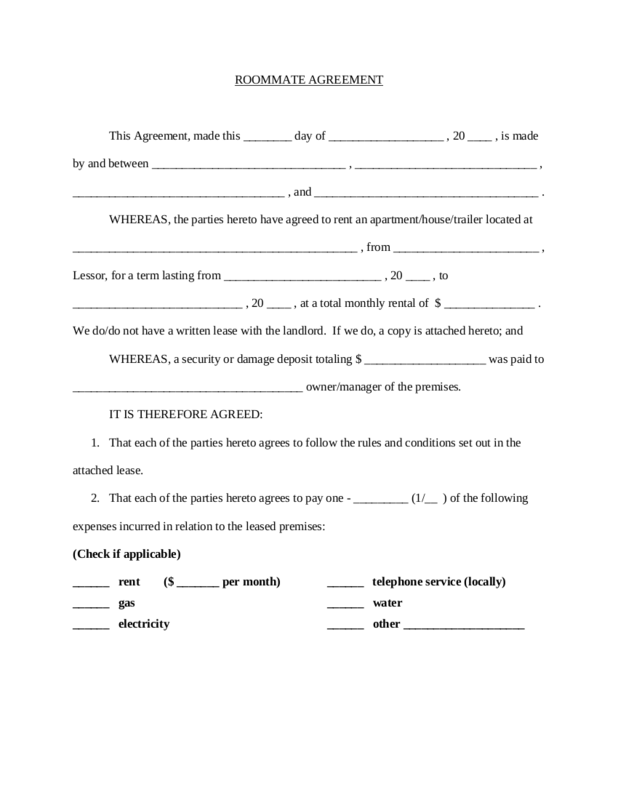 You may also see commercial agreement examples. When you run out of supplies, food, and even money, there are roommates whom you can depend on. When you need some advice in life, they are always read with their words of wisdom and you would also have a fashion guru and a critic of your thesis paper. And as you get closer and closer every day despite starting out as strangers, you will get to hold spontaneous pajama parties, movie marathons, and pigging outs and you can also add having someone to talk to when your midnight or 2:00 a.m. thoughts or whinings about your significant other, and even family matters, would come to bombard you. But then having roommates can be a headache. There are some roommates who are not used to living alone and away with their parents that is why some of them have little to no skills in the household chores department. There are also some roommates who would use your personal belongings without permission and in some cases, it would not be returned, or worse, returned but you could anymore see what it used to look like before since it has been destroyed. You and your roommates might also have different preferences like one like to sleep with the lights on and the other likes to have it turned off. You might also have different timezone due to your class or work schedule that one is awake while the other is asleep and when one is awake, he or she could make noises that would cause the other one to be awake. There are a vast number of reason why roommates can be a pain. 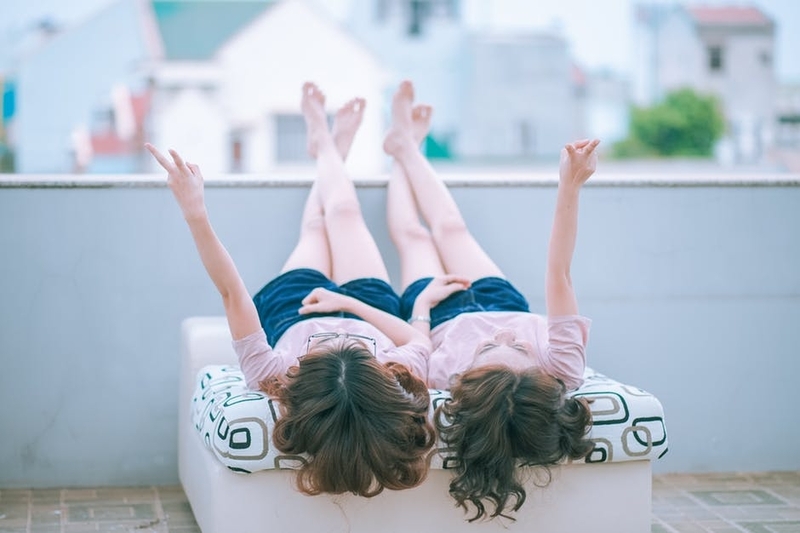 But set aside that gossip, talking behind backs, and exposing of dirty laundry because there is just one thing that could help you live a harmonious relationship with your roommates: roommate agreements. 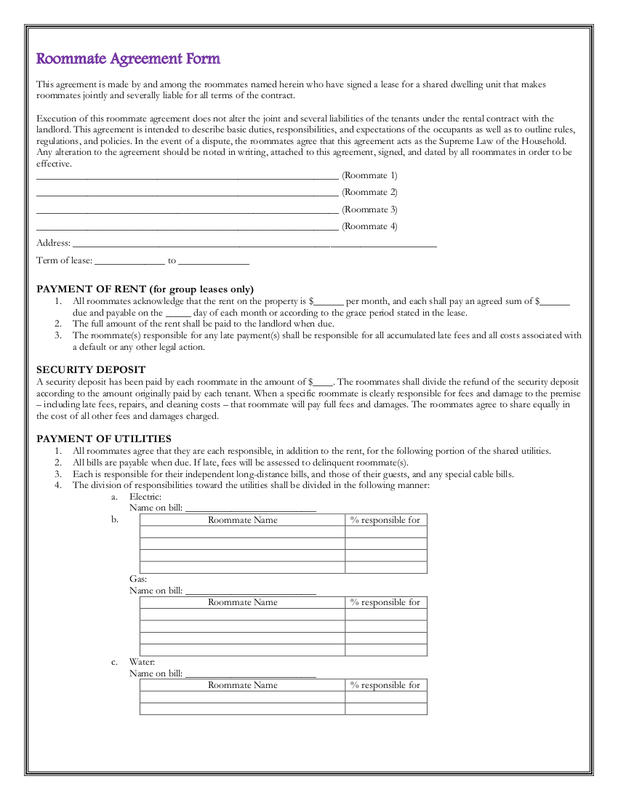 Just like partnership agreements and other business agreements, a roommate agreement also contains the rights, responsibilities and the accountability of the people involved and specified in an agreement. 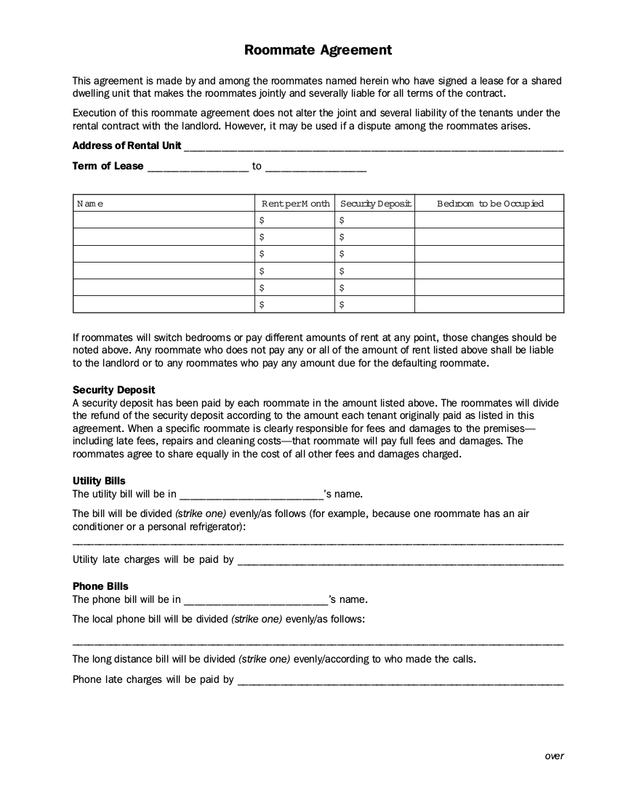 A roommate agreement is a written agreement between you and your roommates that would help in reducing the room-related problems. It will also state each and every roommates’ responsibility as someone who shares spaces, who rents the room, and as a fellow roommate. It simply explains how each one would co-exist in a room in a harmonious way. 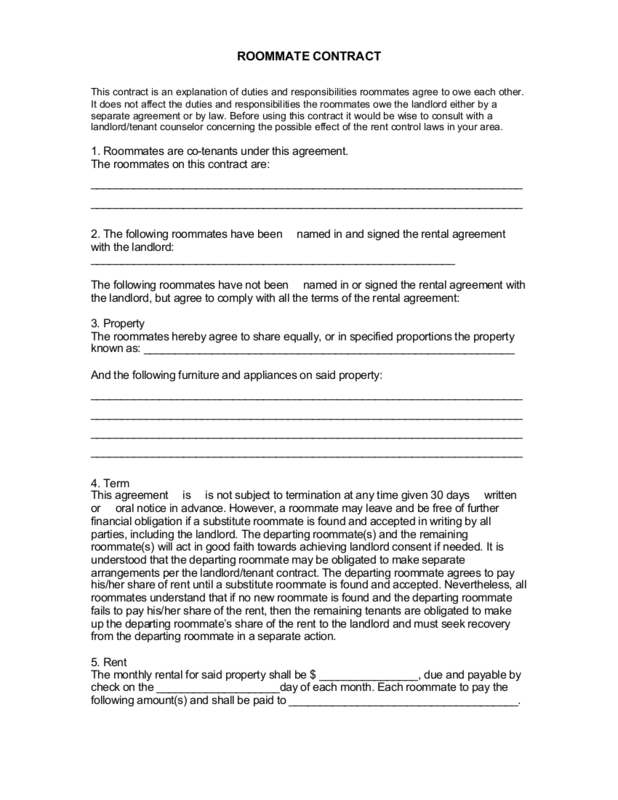 Why Do You Need Roommate Agreements? 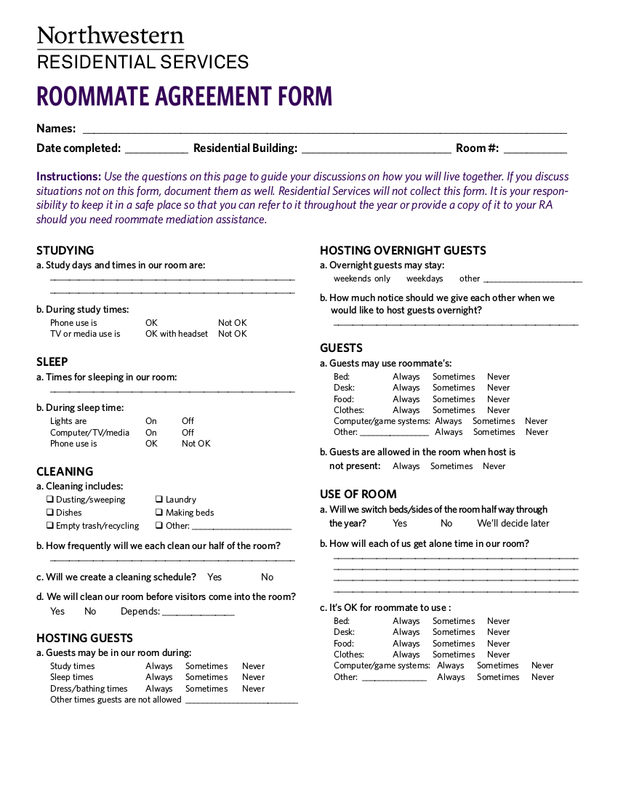 If you have found yourself talking about your roommates’ dirty laundry to other people or you have found yourself complaining and mumbling rather angrily every time your roommates would do something that is not in your favor, then you really do need a roommate’s agreements. Instead of complaining, why not face your roomies and raise the issue up front? 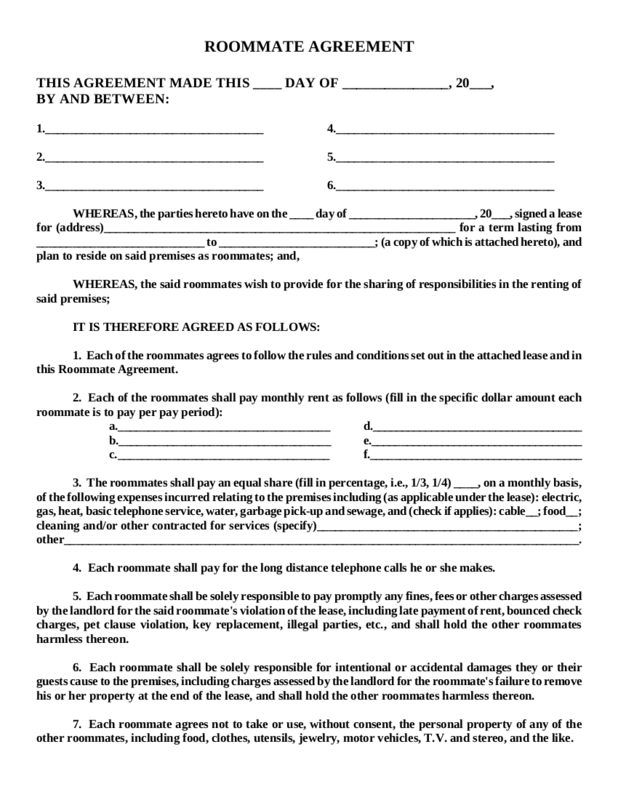 Roommate agreements are straightforward. 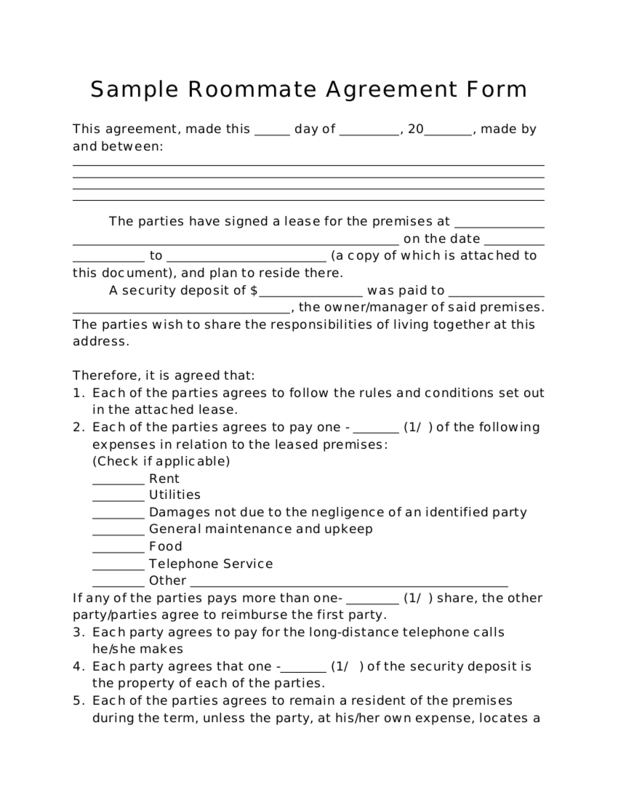 It would dictate things that both you and your roommates the terms that you would agree on or not. 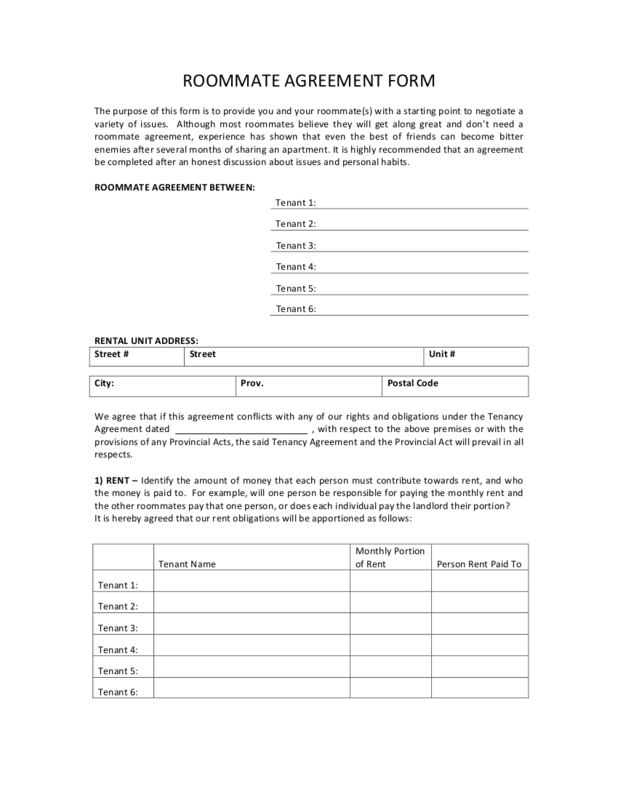 Since roommate agreements are not considered as a legally binding document, you definitely do not need one around when making a roommate agreement. You can have a sit-down discussion with your roommates and discuss what are your preferences, differences, pet peeves, and how are you going to make things work in your shared space. 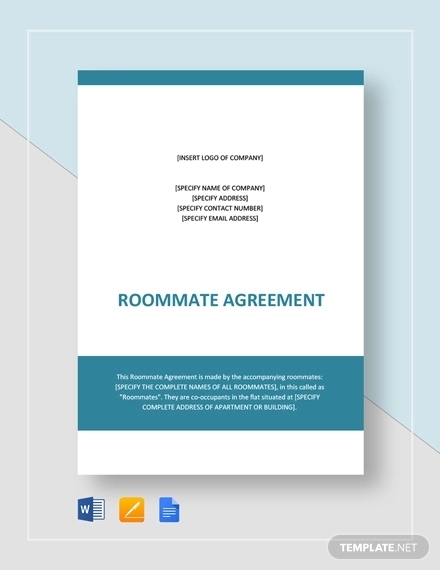 Aside from the obvious importance and benefit those roommate agreements bring which is that these avoid many common roommate problems, there are also other importance and benefits of the said agreement. Have you ever found it hard to discuss your sentiments toward your roomie for fear that your feelings might get misconstrued? 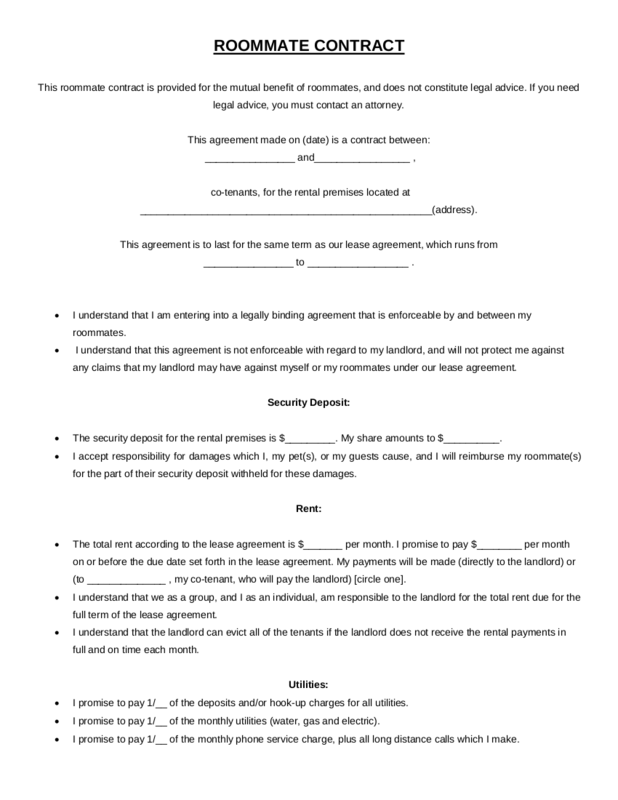 Once you and your roommates would get into an agreement, have it on paper, and have it signed by each one of you, then communication will be easier between each roommate. It is through roommate agreements that you would be able to openly share your ideas and concerns that you would usually just complain it to yourself. Maybe your roommates also have sentiments and concerns about you that they might also want to discuss? Communication is the foundation of every healthy relationship out there, especially if it is an effective communication. It could also be a foundation of a healthy roommate relationship, too. Maybe unspoken rules should be put to an end. 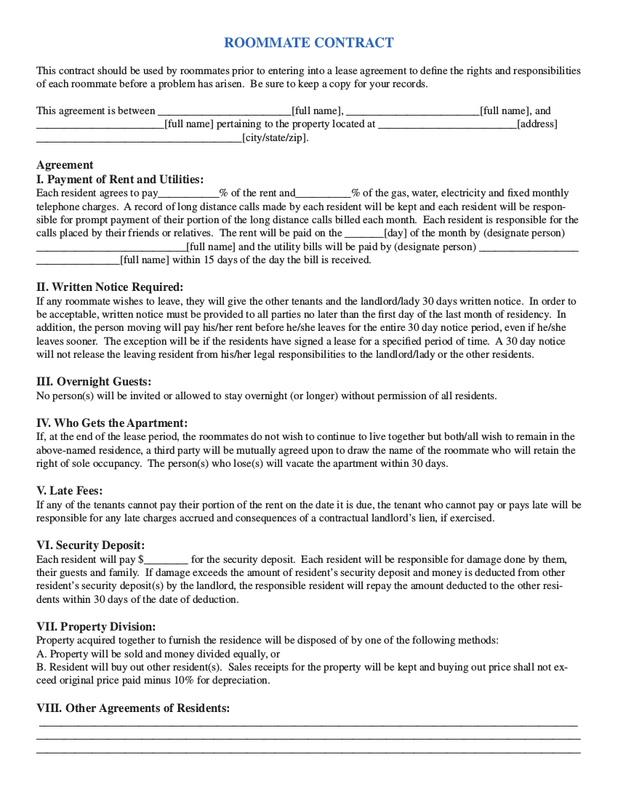 By having a well-written roommate agreements, each one of you will be able to define your own house rules. One of the most important and a common issue between roommates are cleanliness. The issue would usually arise when one roommate does not look after his or her own mess and the other one would be suffering that is why the other one would be cleaning up the other roommates’ mess. The issue would also arise when no one has the initiative to throw out the trash until it would already overflow and no one would be willing to clean the overflowing mess. Usually, the little things that would pile up are usually the ones that would cause a lot of issues and problems in the shared room. 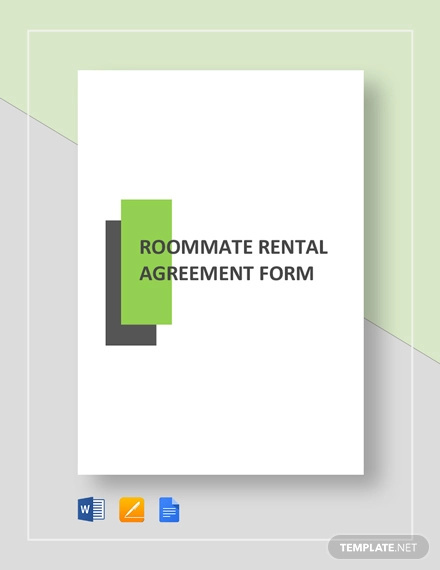 Once you have an agreement, you would be able to lay out all the possibilities that would arise in the room among your roommates as well as its corresponding action and steps on how to resolve it. Through these terms, you would be able to know your ground rules and each of your limitations. Making rules among roommates, especially if you are close friends before living together might feel awkward and too formal. Why would you make rules anyway when you are already friends? Friendships have no conditions, right? Wrong. Even homes, enforced by parents, have house rules, so why can’t you have one with your friends? Roommates would have a marvelous result and that is a harmonious living and co-existence with your roommates. 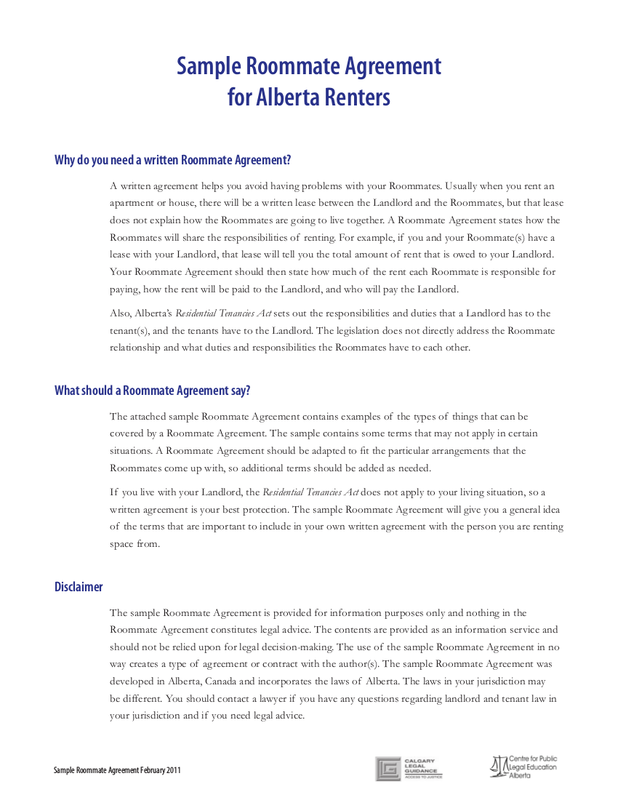 Once you would encounter a problem or an issue would arise, you would be able to take it down by talking about it amicably, with the roommate agreement as a guideline in resolving problems and issues. It will then eventually result in a harmonious relationship and living with your roommates. While there are roommates who would keep all their concerns to themselves, there will come a time when they would not take everything anymore and might just burst out and would cause a big argument that might end up to one leaving and transferring to another room or would look for a new place to stay. There are also roommates who would immediately blow up without giving a room for one roommate to explain. 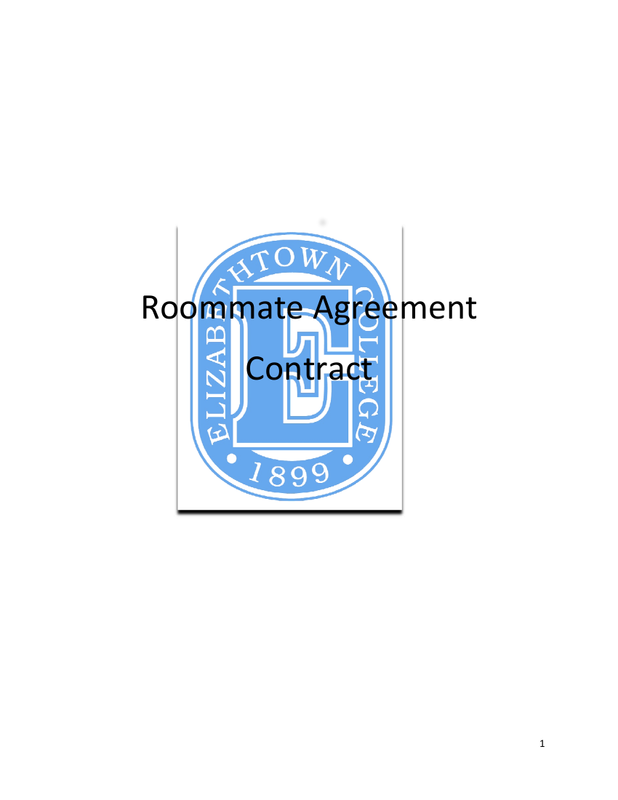 But if they will only have a roommate agreement, roommate arguments will be lessened until it would not be any more possible to happen soon. 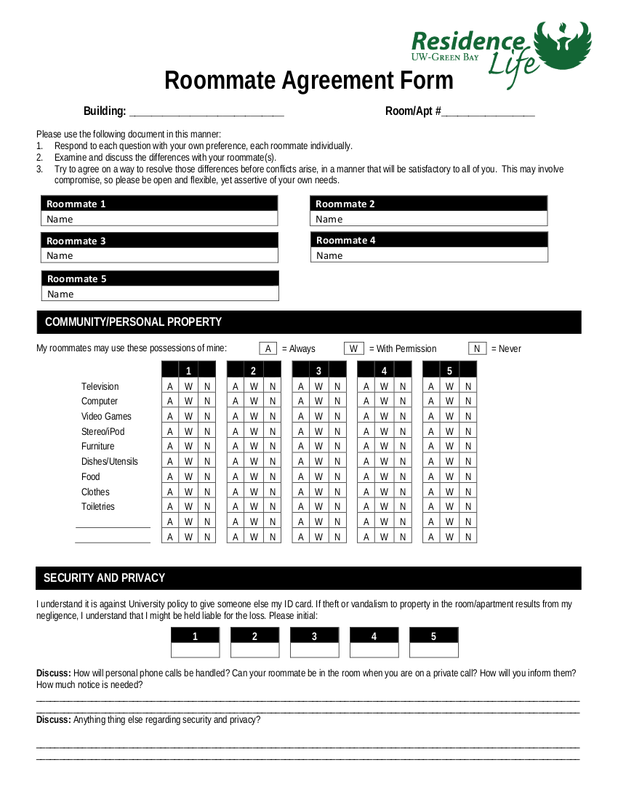 What Should be Included in Your Roommate Agreement? 1. List down the things that distract you. It could be the absence and the presence of light during sleep. It could be your varying music taste. 2. Agree on your quiet and privacy hours. 3. 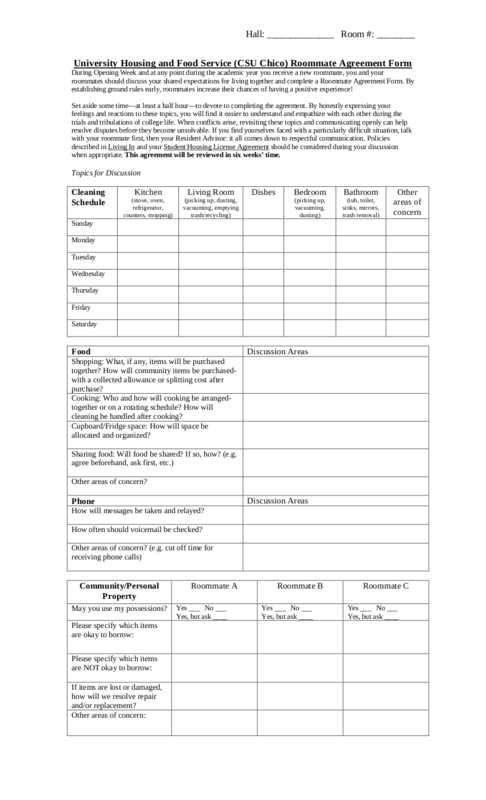 A cleaning schedule and what your individual cleaning assignments. 5. How many hours should you use an appliance so that you won’t incur a high cost of electricity by the end of the month? 6. When are visitors allowed to enter the room? How long should relatives stay? 7. What are the things you can share and what are the things you should not even think about sharing?